HP Officejet Pro 8600 Plus Wireless All-in-One Inkjet. Get high quality, speedy printing with the HP Officejet Pro 8600 Plus Wireless All-in-One Inkjet Printer. Flexible printing There are plenty of connection types when it comes to using the Officejet Pro 8600 Plus, giving you options whatever the situation. Hook up your printer with Ethernet or USB connectivity go wireless with built-in WiFi. With Apple products, the HP printer has it covered. AirPrint compatibility enables you to print from iPhone, iPad and iPod Touch for flexible use. HP ePrint enables you to print from wherever you are as you connect wirelessly and print away. Speedy quality The HP Pro 8600 Plus is equipped for high-resolution printing, meaning whatever you are printing will look good. Print out a business card or report and impress co-workers with the quality as you print on a variety of paper types and formats. High speed printing means you can print up to 20 pages per minute and there is even double sided printing, saving on paper! Not just a printer This printer scans and faxes too, save your documents to the computer and let the HP Officejet Printer go to work. For superb printing whatever the situation, make the HP Officejet Pro 8600 Plus Wireless All-in-One Inkjet Printer the one for you. Buy this HP Officejet Pro 8600 Plus Wireless All-in-One Inkjet Printer - £124.99 ex VAT. WD My Passport Ultra Slim Portable Hard Drive - 2 TB, Black. Connection: USB 2.0 & USB 3.0. Hardware encryption. Automatic backup. The compact, black Western Digital My Passport Ultra Slim Portable Hard Drive delivers fast transfer speeds, automatic data backup and a host of features that make it the ultimate in convenient, portable data storage. So buy this WD My Passport Ultra Slim Portable Hard Drive - 2 TB, Black - £83.32 ex VAT. ASUS K5130-UK016S Desktop PC. Intel Core i3-3220T processor. Windows 8. Hard drive: 1 TB. Memory: 6 GB. With built-in WiFi. With powerful components, the Asus K5130-UK016S Desktop PC delivers a driven performance that gets you through your everyday computing tasks. Fitted with Windows 8 Windows 8 operating system is here and included in your Asus K5130-UK016S Desktop PC. So buy this ASUS K5130-UK016S Desktop PC Now £316.65 ex VAT. EPSON Workforce WF-7525 Wireless A3 All-in-One Inkjet . Cloud Print & AirPrint. Double-sided printing: automatic duplex. Memory card printing. Print quality: 5760 x 1440 dpi. Colour display. Project your credibility with the smart and exceptional Epson Workforce WF-7525 Wireless A3 All-in-One Inkjet. This printer guarantees to provide all the tools you need to produce high quality, perfectly finished business-like documents. Aiming for the top Printing, scanning, copying and faxing, the four elements which make this piece of equipment a must have device for any business, designer or engineer to succeed. The pure professionalism is outstanding, with the ability to print up to 34ppm, in an impressive print resolution of up to 5,760 x 1,440 and a scanning resolution of 1200 x 1200dpi. Double sided success Maximise your printing capability with duplex printing. A4 double sided printing allows for super-fast and paper-saving production, with speeds of up to 7.7 mono and 5.2 colour ppm. Share the connection Epson Connect allows documents or images to be printed from anywhere in the world, through smartphones and tablets, which have access to Apple AirPrint and Google Cloud Print. And buy this EPSON Workforce WF-7525 Wireless A3 All-in-One Inkjet Printer Now £216.65 ex VAT. Toshiba CB30-102 13.3 Chromebook - Silver. Always new: automatic software & security updates. Up to 6 hours of battery life. Storage: 16 GB SSD. 2.2 cm thick & 1.5 kg. Surf, work and play with the streamlined Toshiba CB30-102 13.3 Chromebook. Made for speed The CB30-102 runs on Google Chrome OS, an intuitive web-focused operating system that provides instantaneous access to the internet, app store and online storage. And buy this Toshiba CB30-102 13.3 Chromebook - Silver Now £208.32 ex VAT. ACER C720 WiFi Chromebook - Ash. Always new: automatic software & security updates. Instant on: Standby to online in 3 seconds. 7-second boot up. 100 GB of Google Drive free for 2 years. 1.9 cm thick & 1.25 kg. With a whole host of speedy technology and everything you need to stay in touch with your digital world, the Acer C720 WiFi Chromebook is a lightweight device that will perfectly fit into your online life. Chromebook The Chromebook is built for the web. So buyt his ACER C720 WiFi Chromebook - Ash Now £165.82 ex VAT. HP Pavilion 500-242ea Desktop PC. AMD A8-5500 APU. Windows 8.1. Hard drive: 1 TB. Memory: 6 GB, AMD Radeon HD 7560D + R5 235 dual graphics. Work and play with the effortless everyday performance of the HP Pavilion 500-242ea Desktop PC. Wonderful Windows The Pavilion 500-242ea boasts the expressive Windows 8 operating system and is the ideal platform for controlling your entire digital world with ease. The home screen is based around live tiles, customisable program icons that show updates from a wealth of compatible programs and apps. So buy this HP Pavilion 500-242ea Desktop PC Now £333.32 ex VAT. PACKARD BELL oneTwo S3270 19.5" All-in-One PC. AMD Dual-Core E1-2500 APU. Windows 8.1. Hard drive: 500 GB. Memory: 4 GB. Graphics: AMD Radeon HD 8330. With built-in WiFi. Bring home superb computing with the Packard Bell oneTwo S3270 19.5" All-in-One PC, perfect for the whole family. With Bluetooth 4.0 and USB 3.0 connectivity, you'll be able to connect quickly and easily with this PC. A touch of Windows 8 Optimised for touch, Windows 8 puts your favourite apps and programmes at your finger tips. So buy this PACKARD BELL oneTwo S3270 19.5" All-in-One PC Now £316.65 ex VAT. HP Pavilion 15-n267sa 15.6 Laptop - Purple. AMD A8-4555M APU. Windows 8.1. Memory: 8 GB. Hard drive: 1 TB. Graphics: AMD Radeon HD 7600G. Accessing your internet is simple with built-in WiFi connectivity while integrated Bluetooth provides a handy cable-free connection to speakers, smartphones and a wealth of other peripherals and accessories.You can also watch, play or work on a bigger screen in Full HD thanks to the HDMI port perfect for watching films or playing games with friends. Fantastic features The Pavilion 15 features plenty of handy features to make your life that little bit easier, including a HP TrueVision webcam for staying in-touch love ones, a full-sized island-style keyboard for comfortable typing and high quality DTS sound. Buy this HP Pavilion 15-n267sa 15.6 Laptop - Purple Now £333.32 ex VAT. ACER Aspire V5-122P 11.6 Touchscreen Laptop - Silver. AMD A4-1250 processor. Windows 8. Memory: 4 GB. Hard drive: 500 GB. Graphics: AMD Radeon HD 8210. Crystal Eye webcam and built-in microphone.When you reconnect with friends and family, sharing photos and videos couldn't be easier than with the integrated SD card reader. ANd buy this ACER Aspire V5-122P 11.6 Touchscreen Laptop - Silver Now £274.99 ex VAT. 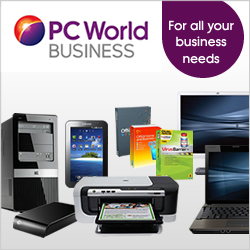 PC World Business has over 20,000 products available to purchase online. Selling all kinds of products from laptops, PC's and tablets to software and printers, peripherals and accessories, as well as offering a next day delivery service. PC World Business offers a fantastic range of products, across all major brands, selling to various sizes and types of businesses. PC World Business also offers a range of professional services such as providing telephone software and remotely managing our clients' networks. Dedicated business advisersare also available in-store and on the phone to offer pre and post sales advise.